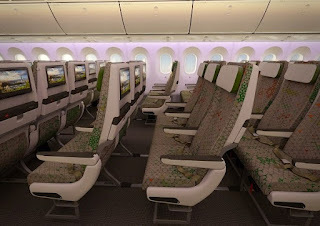 Air101: Inside the new look EVA Air Boeing 787-9 Dreamliner. 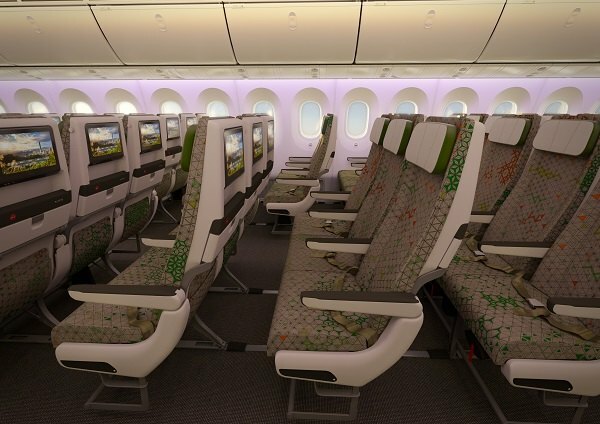 Inside the new look EVA Air Boeing 787-9 Dreamliner. Last week EVA Air announced its first Boeing 787-9 Dreamliner would be delivered at a special ceremony located at Boeing's South Carolina centre in Charleston on 2nd October. However, the carrier gave us all a little sneak preview of the event by showing us inside the new aircraft that has room for 304 passengers. The airline has configured the aircraft to accommodate 26 passengers in its Royal Laurel Class, a true business product and 278 in economy class. The carrier chose Designworks, a BMW Group company, to synchronize the airline’s international brand image and the Dreamliner’s unique craftsmanship into the design of this latest generation of Royal Laurel Class seats. 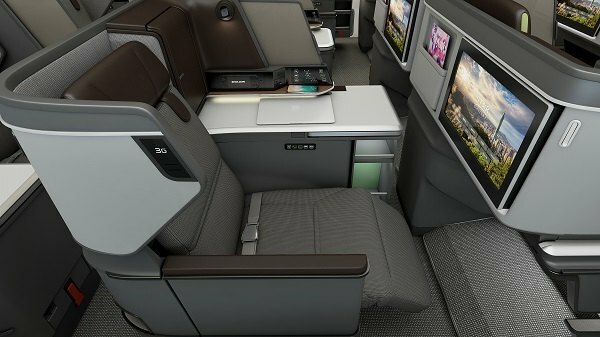 The design team stepped away from conventional aircraft design and used core concepts of space and brand to create tailor-made business class seats seamlessly integrated into a bespoke cabin environment. The team used mature, muted colours to enhance the feeling of a comfortable, spacious environment. EVA’s new Royal Laurel Class business cabin seats are 23 in. (58.4 cm) wide and recline into flat-bed positions that can stretch out to as much as 76 in. (193 cm) long, enabling passengers to lie down, get comfortable and sleep on long-haul flights. EVA created more comfortable personal spaces by equipping its redesigned Royal Laurel Class seats with adjustable privacy panels and generous built-in storage cabinets. The airline upgraded the In-Flight Entertainment (IFE) systems with 18 in. HD touchscreen monitors, the latest noise-cancelling headphones, extra-large fold-out tables for dining or work, auxiliary outlets and USB ports for recharging personal devices or accessing files from Media Player, Photo Viewer and PDF Reader. With these features and the warm, friendly service it is known for, EVA offers passengers a cozy in-flight space where they can work and rest. EVA called on the Boeing Company’s long-time working partner, Teague, to completely redesign Economy Class on its new 787 Dreamliners. It selected a colour palette that complements shades used in Royal Laurel Class and has created a cabin that is exquisitely elegant. EVA selected ergonomically designed economy class seats from RECARO, the well-known German Automotive Seating company. It equipped seats with sophisticated leather headrests that adjust as much as 6 in. from the top of the seatback to the highest position. It added customized neck supports with functions, allowing passengers the flexibility to adjust the angle in six directions. It also upgraded the IFE with 12 in. HD touchscreen monitors at every seat, giving passengers more comfort and satisfying entertainment needs 30,000 feet in the air. In addition to this first Boeing 787-9, EVA expects to take delivery of three more of this model and followed by its first Boeing 787-10 in the second quarter of next year. EVA plans to be operating a total of 24 Boeing 787 Dreamliners by 2022. As soon as EVA gets its first Boeing 787-9, it will finalize preparations for putting the plane in service and work with Taiwan’s Civil Aeronautics Administration (CAA) to get it certified.